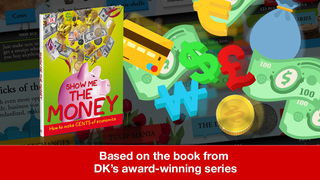 ‘Show me the money’ is an app developed by the Y Factory and is based on the bestselling book from DK Publishing. The book sold over 160,000 copies in 18 countries. The app explores how money has changed through the ages, how banknotes have been produced and protected against forgery. It also covers how credit cards were born and much more. The app is an interactive guide with dynamic graphics which brings the content to life. 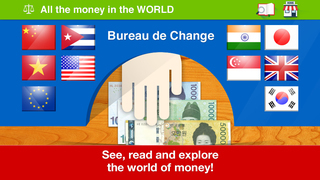 The app is a good tool to teach children about the fascinating and multifaceted subject of money. The app is recommended for ages 9 to 11. Upon opening the app the user is greeted with some delightful graphics in landscape mode. Here there are several options. The ‘info’ icon provides adult restricted information about the developers and the publisher’s websites. The websites are launched within the app which can be slow but also keeps the user within the application. The ‘Settings’ icon can be useful for changing languages from English to Korean (we would like to see more options here) and turning off the narration, sound effects and tutorials. We recommend that all of these are left turned ‘on’. The ‘Contents’ icon lets the user choose the sections of the app within the content. A helpful graphic is presented here. We recommend that the user or teacher goes through the whole app until they are familiar with the content. This could be great for specific topics for classes or student research. Return to the main screen by using the ‘Home’ icon. The ‘Coin collection’ icon enables the student to collect different coins when answering a series of questions at the end of the app. This is a nice touch and will motivate student within the classroom. The collection can be reset and the collection is retained when the app is shut down. The ‘Read’ icon opens the interactive book. The hand icon encourages the user to interactive with the images. There is again a ‘settings’ icon and a ‘search’ icon. We did notice that when we pressed the ‘search’ icon and entered the breakdown of the book when we pressed ‘Home’ to opt out it returned us to the beginning of the app. There may be a need for a back button here. The early stages of the interactive book are quite engaging although we did find the graphics very basic. The narration is at a nice pace and very clear. As we progress through the app the graphics certainly improve and there are a variety of interactive features. The ‘Deal or no Deal’ section introduces bartering and how money came about. We felt that some kind of date or timeline might be appreciated by the user here. It is not until ‘The History of money’ that the developers introduce a timeline. These timelines are very interactive, demonstrate great graphics and plenty of useful information. The ‘All the money in the world’ section again has some nice interactive features and gives the user an insight into different currencies. The ‘Making money’ section is one of our favourites especially when using the magnifying glass and the UV light detector over the currency. The ‘Fantastic Plastic’ section enables users to look over a large credit card which gives detailed information using the zoom feature. ‘Playing the market’ introduces students into the stock market and the interactive book finishes with a section on ‘Trading without money’. Once the book is complete the app gives the user a ‘Quiz time’ feature. We noticed that you cannot step back here to the page just turned. The quiz retains the score of the last attempt and asks students a series multiple choice questions based on the interactive app they have just read. There are also keyword questions and true or false. The feedback is instant with a red for incorrect and a green for correct with one try again feature. Each correct answer is awarded with a different coin that is collected and displayed in the Home page. We felt that some of the questions were far too easy and that some were far too hard. Trying to recall information from the whole app was difficult. The developers may consider adding questions at the end of each section of the app rather than at the end of the whole application. You can read the section again that are linked to the questions you got incorrect which is a good feature. Students will no doubt enjoy collecting the coins as rewards. The app may benefit from a share or print feature. Here scores could be shared with others or sections of the app could be printed to create resources or displays. Apart from the vast content, which is very thorough, we are unsure of its educational value other than that as a resource. If you are looking for a resource to teach children about the story of money then this is an excellent option. What is money and how has it changed through history? How are banknotes protected against forgery? How was the credit card born? 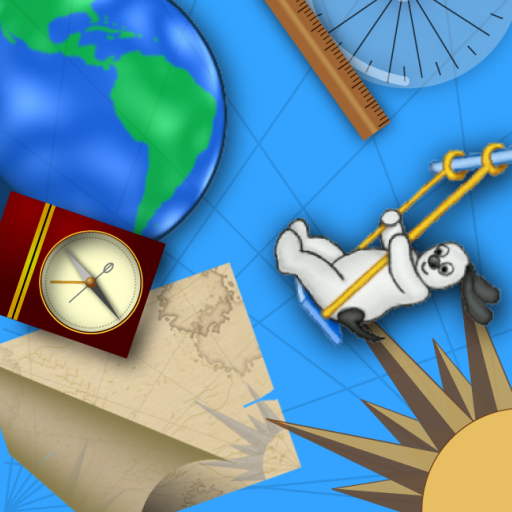 Find the answers to these and other questions in this fun and educational app. 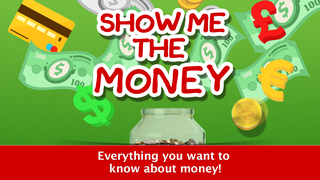 Show Me the Money is the app based on the popular book that has sold more than 160,000 copies in 18 countries. 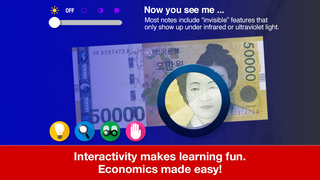 This app is the perfect tool to teach children about the fascinating and multifaceted subject that is money. Through fun graphics, sounds, and interaction, children will understand how it works, what it means to them, and how to use it wisely. Packed with information including key terms, events, and thinkers, this app will teach children everything they need to know about money. The Institute for Public Policy Research showed that children in the US who received compulsory financial education in schools were around richer by the time they reached their 40s. Teach your children about money and help them lead richer lives! DK is a publisher of books, eBooks and apps in more than 100 countries and 60 languages. Founded in London in 1974, DK is a leading illustrated reference publisher for children and adults. DK is part of the Penguin Group which, as of the 1st of July 2013, officially united with Random House to create Penguin Random House, the world's first truly global trade book publisher. At Y Factory, we try our best to bring out content’s true meaning and value through quality applications for children. With optimized content experience, we provide children pleasure of new discoveries and learning on their own. With this approach, Y Factory connects children and parents, culture and technology, and digital and hearts. The Show Me the Money app uses a third-party app service provider in order to create accurate, real-time user data reports so that we can continue to improve the app user experience. The service collects and submits anonymous aggregated data about which app features are being used most frequently as well as your mobile device UDID (unique phone Identifiers) and/or IMEI (International Mobile Equipment Identities), which are also anonymised via a secure hashing protocol, to Adobe servers. This information will be used to continually improve the features and functionality that we release in its subsequent versions of our mobile apps.